The Reverend Sonya Williams-Giersch is an ordained pastor of the Evangelical Lutheran Church of America (ELCA). She began her professional service to the wider church in 2002 after a career in the telecom and consulting industry. Sonya became rostered and commissioned as an Associate in Ministry (AIM) in December 2006 and ordained in May 2014. Pastor Sonya holds a dual Bachelor of Science degree in Business Administration and Economics, a Master’s Degree in Administration/ Management, and completed her theological studies with a Certificate in Theological Studies from the Lutheran Theological Seminary at Gettysburg. She has extensive experience in worship planning and leading, Christian education, youth ministries, music ministries, pastoral care, visitation, administration and management. 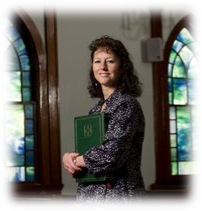 Sonya was born and raised in the Shenandoah Valley and is involved in numerous community ministries and activities. She and her husband, Richard, daughter Gabrielle, and twospoiled cockapoo dogs all reside in Strasburg, Virginia.